THE GRID for the 2017 running of the Liqui-Moly Bathurst 12 Hour is set. 13 of the of the contenders for this weekend’s Liqui-Moly Bathurst 12 Hour assembled on the famous Bathurst grid this morning, alongside their drivers including Supercars stars Craig Lowndes, Jamie Whincup, Shane van Gisbergen, Garth Tander and internationals such as Maro Engel, Chris Mies, 2016 champion Alvaro Parent and 2015 race winner Katsumasa Chiyo. 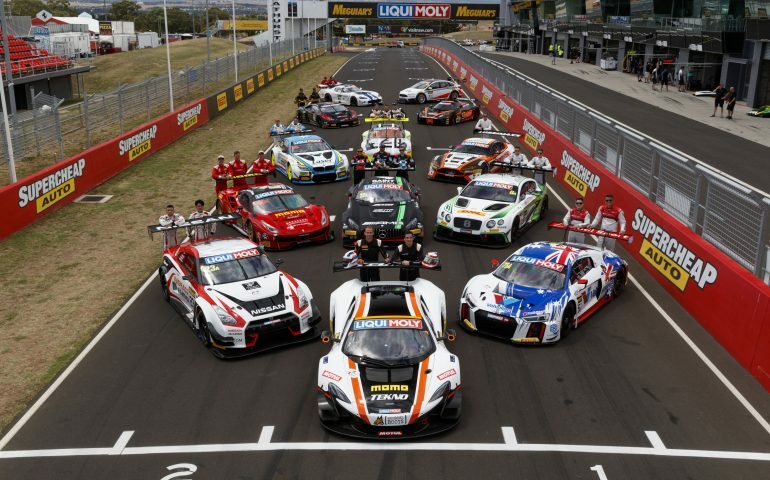 The Liqui-Moly Bathurst 12 Hour begins tomorrow with four practice sessions, ahead of final practice, qualifying and a Top 10 Shootout on Saturday. On Sunday the mountain comes alive with 12 hours of world-class GT Racing, to be broadcast live on 7mate. Bathurst Regional Council mayor Cr. Garry Rush said the Liqui-Moly Bathurst 12 Hour was a vital event for the local economy. “What a great quality field – not only the manufacturers but also the drivers involved,” Cr. Rush said. “The most outstanding thing for me is, and it’s repeating through the drivers when I have discussions with them, is that it is their favorite event of the year and that it’s the best track they have driven on. The event features the biggest grid ever assembled for the race, including factory supported entries from Audi, BMW, Bentley, Mercedes, Porsche, Ferrari and Nissan. Star drivers, like six-time Bathurst 1000 winner and 2014 12-hour champion Craig Lowndes, also can’t wait to return to the Mountain. “We were here in the Ferrari 458 a couple of years ago and we’ve come back in the 488. It’s a nice car and a step up from the 458 – but you only have to look at this field to see how it has stepped up. Teams and drivers hit the track tomorrow for four practice sessions, with live audio coverage and live timing available via the Liqui-Moly Bathurst 12 Hour website.